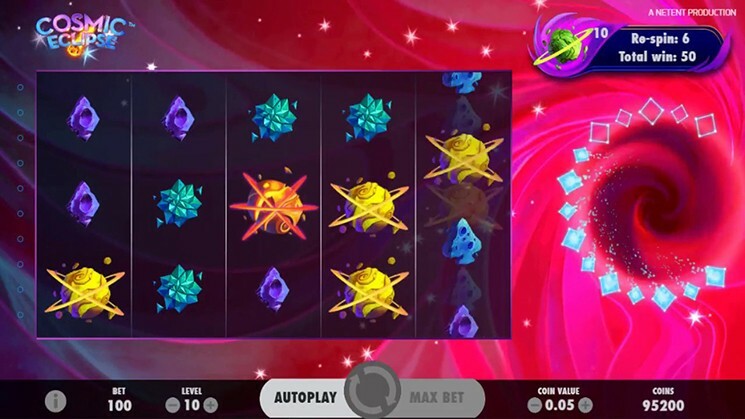 Cosmic Eclipse is standart five reel and 10 paylines video slot powered by NetEnt software platform. Video slot have a fun space atmosphere, with really cartoony feel. Low paying symbols are your hearts, clubs, spades and diamonds, all symbols are appropriately themed. Higher paying symbols are 6 different colored rocky planets. In addition, Wild symbol is a stone fragments collection with the word “Wild” in it. Before investing real money players can try Archangels Salvation Slot for free, or visit any NetEnt Casino such as: Frank Casino, Wild Tornado Casino, Crazy Fortune Casino and others to play with real money and win. Before you start your space adventure, your bet need to be placed. Coin denominations can be adjusted using “Coin Value” button. Number of coins per line can be set by “Level +/-“. Highest bet value can be placed by “Max Bet”. “Autoplay” button is for setting up number of times the reels will turn automatically and “Spin” button is represented as two arrows. Unfortunately, Cosmic Eclipse slot have only one bonus feature available. Black Hole Bonus feature is activated when a cosmic swirl lands anywhere on the last reel. On the right of the game window, swirl will be activated. Swirl will randomly choose one symbol from the reels to become an active symbol. All active and Wild symbols then will be collected in the special symbol meter, giving you a re-spin. Black Hole Bonus feature will end when number of the collected symbols goes to 15, or all the awarded re-spins are finished. After the feature has ended, the game randomly will place all the symbols that where collected on the reels to giving you at least 1 guaranteed chance to make a win. In addition, if all of your 15 symbols that land on the reels are the same, you can win up to 600 times your stake.